Every bountiful table needs a gorgeous centerpiece to help make the occasion more festive. Check out some options (link to our website Thanksgiving flowers) here. For your table--traditional centerpieces (with or without candles), cornucopias chock full of flowers or short pave style vased arrangements look lovely. Don't forget something nice and showy on your entry table to welcome guests, and a small but sweet bouquet in the guest bathroom will show that you pay attention to the details. However, there are so-so-many other ways to bring fresh flowers into the festivities. 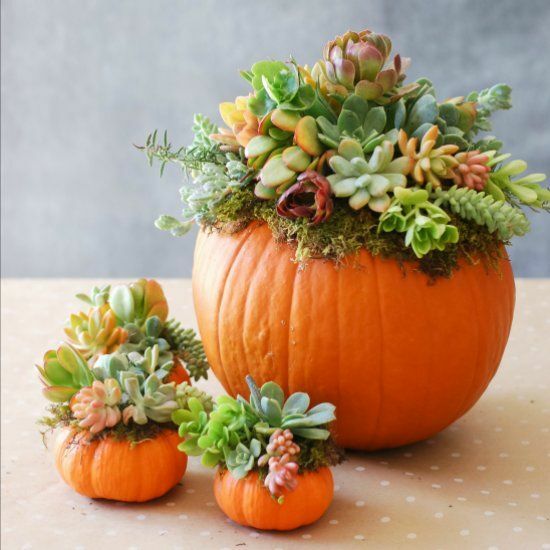 Think outside the vase for fall floral decor. . .
*Don't forget your front entry! A nice big basket of mums or a pretty fall wreath can greet guests and fuel anticipation of what's waiting inside. *Speaking of fall wreaths, it is perfectly fine to mix mediums. . . it's not illegal to combine silks, dried and fresh! A nice silk floral wreath can only look prettier when sprigs of dried wheat or monkey pods are added. To add a pop of color, tuck in a sprig of fresh flowers into a water tube, hiding the mechanics behind the wreath. *A bit of fall daisies or red hypericum is a welcome surprise when tucked into a napkin ring. *Sometimes, a little goes a long way. A few antique bottles gathered on a mirror only need a bit of tall bittersweet or curley willow to become a focal point. *Unusual containers can change a pretty bouquet into something spectacular. Have a bouquet designed in a plain cylinder vase, then tuck that vase into an old bucket, Great-grandmother's cookie jar or canister, maple syrup pails, anything mismatched or old and vintage can be a great conversation starter. *Mantle tablescapes need just a pop of color. Varying sizes of candles and candleholders with gourds, dried fall leaves and/or fresh fruits at their base look lovely, but up the ante a tiny bit but purchasing loose stems and water tubes. Solidago, fall pom-poms, roses or hypericum add color and interest. Simply cut the stem down to fit the water tube, then tuck the tube in behind a gourd or peeking out from under a leaf. The flower will stay fresh for a day or two inside a water tube. * Candles can add a gorgeous glow to any Thanksgiving table. One fun alternative that uses just a few flowers but packs a nice visual wallop is to create a layered candleholder. Start with a wide cylinder vase and layer in dried legumes such as yellow or brown lentils, green split peas, yellow dried corn kernels--even whole coffee beans add a nice deep brown color and a homey aroma. Layer your drieds about halfway up your vase. Using water tubes, cut small sprigs of daisy buttons or pompoms, carefully tucking them down into the drieds. This will create a floral 'carpet' to rest a nice pillar candle. Thanksgiving is a holiday that celebrates bounty (and even excess!) but small pops of color and unusual containers can surprise your guests and make your home warm and comforting.